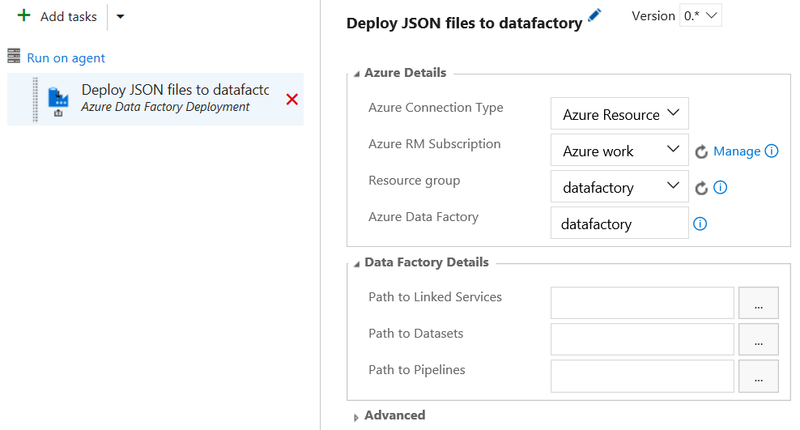 Visual Studio Team Service deploy task that will deploy JSON files with definition of Linked Services, Datasets and/or Pipelines to an existing Azure Data Factory. Path to Triggers [Optional] - Path to the folder in the linked artifact in which contains the JSON definitions for the Triggers. Only available in V2. Overwrite - Option to overwrite existing definitions with the new ones. Continue on Error - Option to continue deploying after errors occur. Clear before Deploy - Option to clear the existing difitions before new ones are deployed. Only if a path to Linked Service/Datasets/Pipelines are provided the existing will be cleared.